The unique ceiling light by less n more was named after Athene, the Greek goddess of wisdom, arts and crafts. The name was very well chosen since this less n more Athene 70 ceiling light is also a true piece of craftsmanship. The innovative design of this ceiling light combined with the extraordinary colours and the high flexibility make sure that the amazed viewers cannot take their eyes of these pieces. A special highlight: each of the overall six light heads is located on a 920 mm long flex shaft which can be aligned according to your personal requirements. 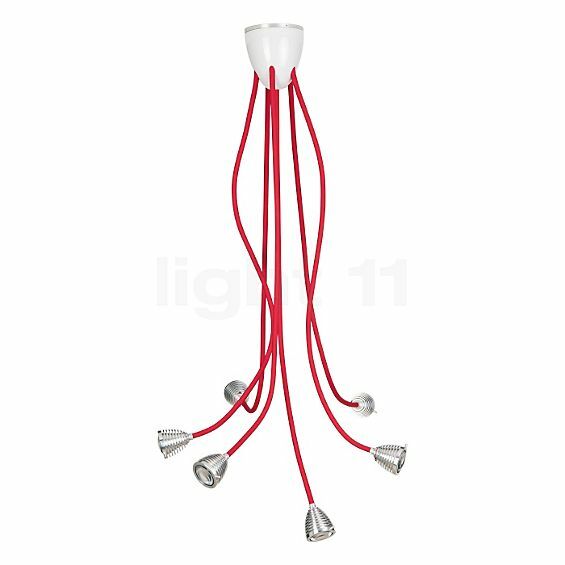 The less n more Athene 70 ceiling light can, for instance, be arranged to look like a chandelier, however, it is also quite easily possible to create playful designs with knots and bows. Thanks to the flex shafts, there are no limits set to your fantasy. Due to the high flexibility the Athene 70 ceiling light is ideally suited to provide for zone lighting above your dining table, however, this light also cuts a great figure in the kitchen or in the living room. The individual spotlights can be arranged as desired in order to, for instance, specifically illuminate certain objects such as paintings or pieces of furniture. The ceiling canopy and the light heads of the less n more Athene 70 ceiling light are manufactured from aluminium, while the flex shafts are covered with coloured textile. Thanks to modern LED technology, the Athene 70 ceiling light has a very positive environmental balance. Each of the six LED lights only consumes six watts; additionally, LED illuminants offer an extremely long service life – this is not only great for your wallet but also for the environment since less waste is produced. Besides the transformer, the scope of supply also includes the LED illuminants. The less n more Athene 70 ceiling light is available in different colours. The flex shafts are covered either with red, white or black textile or they are optionally also available without any cover. The design of this unique ceiling light was justifiably showered with different awards, including coveted prizes such as the “Red Dot Award”, the “Designpreis Deutschland” award (German Design Award) as well as the “Leuchte des Jahres 2010” award (Light of the Year 2010). In addition to the ceiling version, light11 also offers further products from the Athene series by less n more. Tell other customers and us about your experiences with the Athene A-6DL 6er Ceiling Light !